While on a visit to a naval base in Russia’s western enclave of Kaliningrad, President Medvedev tested the latest masterpiece of Russian gunsmiths – a rifle that can shoot almost as well in water as above ground. The president’s visit was timed with the Zapad-2009 military exercise. 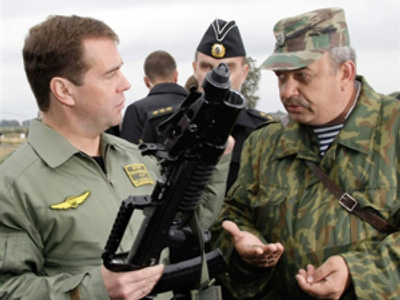 Although stormy weather forced Russian commanders to cancel the pre-planned show of paratroopers dropping directly into the sea, they entertained the head of state with a different show – Medvedev personally tested the ADS assault rifle. This weapon is currently being tested, but designers claim that they have solved an old problem and their gun can shoot both underwater and in regular conditions. ADS stands for “special double-environment automatic rifle”. When used on normal terrain, the firearm shoots regular 5.45x39mm Kalashnikov rounds, and for underwater use employs a specially developed cartridge where the weapon shoots a specially developed cartridge with a 53-millimeter-long bullet fitted to the Kalashnikov’s case. The muzzle velocity of the bullet is 330 meters per second and the effective range is reported to be 25 meters at a depth of five meters, and 18 meters at a 20-meter depth. A special cavity at the tip of the bullet creates a sort of air lubrication around it and helps to stabilize the bullet in the water. The gun was designed for Russian underwater commandos who had reportedly complained that their current weapon – the APS, or “special underwater automatic rifle”, which shoots steel needles and cannot be used in ground operations. When armed with ADS rifles, the soldiers can abandon the practice of carrying two rifles – one for surface and one for underwater fighting. 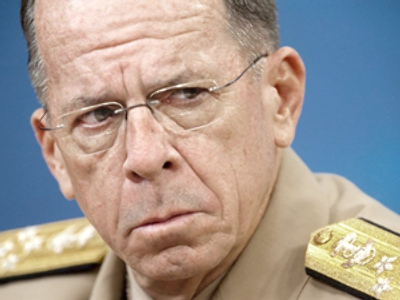 The military, who received the president’s praise for their well-prepared and executed training also presented the president with a combat knife made of a special alloy that also can be used equally well on the shore and in the depths of the sea. 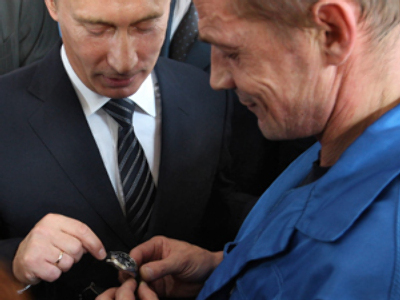 Medvedev, in line with Russian tradition, which considers it a bad sign to present sharp objects, gave a coin in return.